The Perth Mint of Australia expands its Lunar Series II program with several new 2014 Year of the Horse Gold and Silver Coins. Each of the new releases is available now in limited mintages. Compositions of the strikes include 99.99% pure gold or 99.9% pure silver and encompass proof quality colored gold coins, silver gemstone coins, silver gilded coins, colored silver coins and a silver typeset collection. Coins of the Lunar Series II program debuted from the Perth Mint back in 2008. New strikes are released annually in the series with each subsequent year showcasing one of the twelve creatures of the Chinese zodiac. 2014 is considered the ‘Year of the Horse’ so the equine is featured on the reverse side of all the new releases. The original designs first debuted on the Perth Mint’s 2014 Year of the Horse Gold and Silver Bullion Coins which made their inaugural appearances earlier this year. They were also featured on the gold and proof versions that launched in early September. 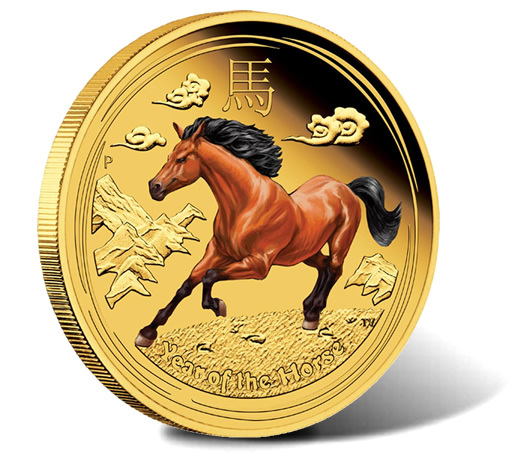 Three new 2014 Year of the Horse Colored Gold Proof Coins are now available with each struck from 99.99% pure gold. Included options are 1 oz, 1/4 oz and 1/10 oz with maximum mintages stated as 3,000 of the one ounce version and 5,000 for both of the smaller ones. Shown on the reverse of each colored gold coin is a horse hued in lifelike tones. The horse is set against a stylized mountain and cloud scene. Each individual coin ships in a glossy timber-effect lid Perth Mint presentation case with a numbered certificate of authenticity and an illustrated shipper. Initial pricing of the gold coins are listed as AUS $2,450.00 for the one ounce coin, $631.82 for the 1/4 ounce coin and $271.82 for the 1/10 ounce coin. Respective US prices are $2,283.38; $588.85; and $253.33. 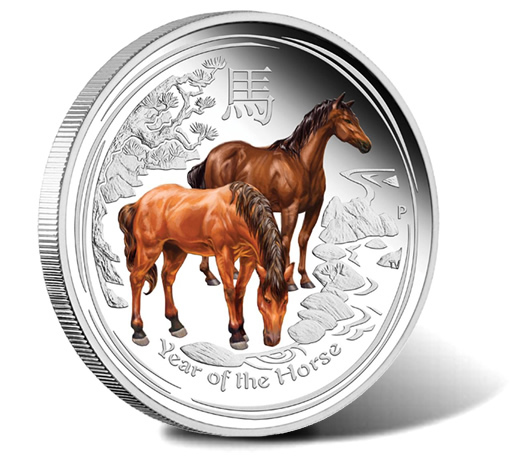 The largest option in the new releases is the 2014 Year of the Horse 1 Kilo Silver Gemstone Coin. This piece is composed of one kilo of 99.9% pure silver and features a white diamond. The diamond replaces one of the eyes of the two horses. Both horses are colored and depicted in a stylized Chinese landscape. Maximum mintage for the release is capped at 5,000. 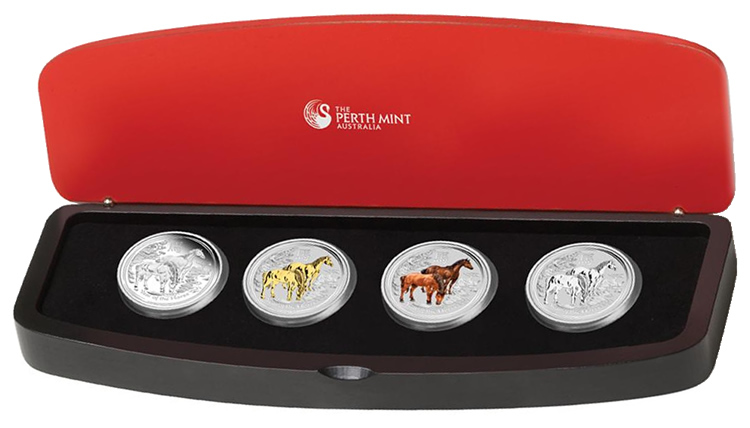 Each 100.60 mm diameter coin is presented in a Perth Mint black and red display case. Debut pricing is AUS $1,590.91, or US $1,482.71. 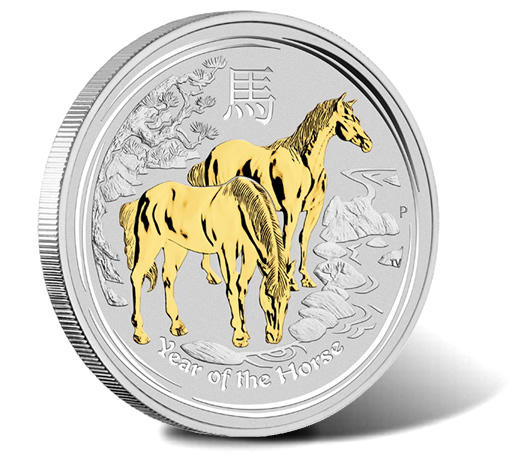 Struck from one ounce of 99.9% pure silver, the 2014 Year of the Horse Silver Gilded Coin has the same basic reverse image as seen on other silver releases. However, the two horses on the reverse are gilded in 24-karat gold. The gilded coin is available with a display case and certificate of authenticity or just a capsule which also ships with certificate. The capsule may be used as part of the larger twelve-coin gilded Lunar Series II collection for which cases are still available. Mintage for the coin is set at 47,500 for this product option with a maximum mintage of 50,000. Current pricing is AUS $85.45, or US $79.64. 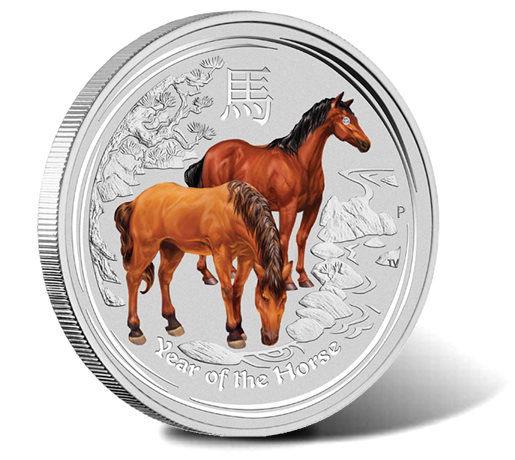 Two new 2014 Year of the Horse Colored Silver Proof Coins are also available. These include a one ounce version as well as a 1/2 ounce size. Both feature the same basic reverse image of two horses in a Chinese landscape with the horses colored to a lifelike representation. The maximum mintage for each release is 10,000. Black and red Perth Mint display cases are shipped with each purchase. Pricing is listed as AUS $90, or US $83.80, for the one ounce coin and AUS $57.73, or US $53.80, for the one-half ounce coin. Offered in extremely limited mintage, the 2014 Year of the Horse Silver Coin Typeset Collection is capped at 1,500. Included in the collection are four different versions of the 2014 Year of the Horse Silver Coins. This includes a proof quality version, a gilded version, a colored version and a bullion version. Each is from one ounce of 99.9% pure silver and showcases the same basic reverse image of two horses. The collection ships together in a single Perth Mint display case with a numbered certificate of authenticity. An illustrated shipper is also included. Pricing is listed as AUS $318.18, or US $296.54. All of the above options may be purchased directly from the Perth Mint of Australia.